This article introduces the features that are available in the Technical Preview for System Center Configuration Manager, version 1801. You can install this version to update and add new capabilities to your Configuration Manager technical preview site. On the General tab, give the phased deployment a name, description (optional), and select Automatically create default pilot and production phases. Populate the Pilot collection and Production Collection fields. Select Next. The computer that runs the Configuration Manager console requires Internet Explorer 9 or later. Based upon your user voice feedback, you can now schedule automatic deployment rule (ADR) evaluation to be offset from a base day. For example, an offset of two days after the second Tuesday of the month evaluates the rule on Thursday. In the Software Library workspace, expand Software Updates, and select Automatic Deployment Rules. Right-click on Automatic Deployment Rules and choose Create Automatic Deployment Rule. Follow the prompts to complete the General, Deployment Settings, and Software Updates tabs. On the Evaluation Schedule tab, select Run the rule on a schedule and Customize. For the custom schedule, select Monthly and put in a base day such as the second Tuesday. Check Offset (days) and the number of days for the offset then OK when finished. Complete the rest of the Create Automatic Deployment Rule Wizard. This feature lets you reassign a distribution point to another primary site without redistributing the content. This action updates the site system assignment while persisting all of the content on the server. If you need to reassign multiple distribution points, first perform this action on a single distribution point, and then proceed with additional servers one at a time. The site system server can only host the distribution point role. 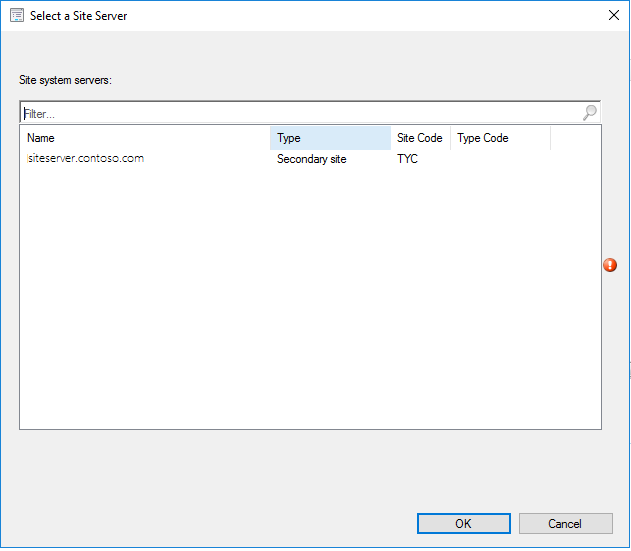 If the site system server hosts another Configuration Manager server role, such as the state migration point, you cannot reassign the distribution point. You cannot reassign a cloud distribution point. This option is not functional with this release due to the Technical Preview limit of a single primary site. Consider the scenario, and then send Feedback from the Home tab of the ribbon, regarding the capabilities of this action. Select the site server and site code to which you want to reassign this distribution point. For newly added classes, string lengths greater than 255 characters can be specified for hardware inventory properties that are not keys. In the Administration workspace, click on Client Settings highlight a client device setting to edit, right-click then select Properties. Select Hardware Inventory, then Set Classes, and Add. Fill in Computer Name, WMI namespace, select recursive if needed. Provide credentials if necessary to connect. Click Connect to view the namespace classes. Select a new class then click Edit. Change the Length of at least one property that is a string, other than the key, to be greater than 255. Click OK. Ensure that the edited property is selected for Add Hardware Inventory Class and click OK. Collect hardware inventory with the newly added class containing a property greater than 255 characters in length. In this version of the Technical Preview, improvements have been made for Software Center customization under the client settings. The client settings for Software Center now have a Customize button. A preview has been added to show what the Software Center banner looks like. If a logo is not selected, the preview shows the company name text and color. If a logo is selected, the preview shows the logo and company name text. Hide unapproved applications in Software Center is a new setting for Software Center. When this option is enabled, user available applications that require approval are hidden in Software Center. In the Administration workspace, click on Client Settings. Select a client device setting to edit. Right-click on it then select Properties then Software Center. Click on the Customize button. Try out the different customization settings including the preview. Enable the setting Hide unapproved applications in Software Center. Observe the changes in Software Center. For Windows 10 version 1709 and later devices, there are two new host interaction settings for Windows Defender Application Guard. The Run Scripts feature now allows you to import and run signed PowerShell scripts. To keep the script integrity, signed scripts must be imported rather than using copy/paste. Imported signed scripts cannot be edited after import. In this Technical Preview, there are two temporary limitations. Scripts can only be imported in the Run Scripts feature and can't be edited directly from the console. Scripts imported with a non-Unicode encoding may display in the console incorrectly. The script will still execute as originally written.